Nutrition | So You Wanna Get Jacked? Gaining Muscle While Losing Fat: Is It Possible? So You Wanna Get Jacked? Be yourself, only more jacked. As summer has recently left, we can only expect cooler temperatures, shorter day and miserable weather. This is when the general population decides that its time to completely loosen up on their diet and training and enter “bulking” mode. Time over time I hear people saying, “Ah summers gone, I won’t be shirtless so I’ll just stop doing cardio, eat more and start bulking”. Okay, that’s cool, but why?! Unless you’re competing there is no in season or offseason and definitely no need for bulking and cutting phases. Just because summer is over doesn’t mean that you can totally ease off of healthy eating and hard training. This should be the time that you take advantage off, kinda like the construction period before the grand revealing. The idea that bulking (which includes eating more calories, putting on muscle and some noticeable fat gains, training heavy with lots of rest, reduction of/or no cardio) is the only way to put on muscle is ridiculous. Do you know what comes as a result of bulking? Excess fat gains. Yeah, not so good. We want to build muscle and burn fat simultaneously. Traditional broscience says it’s not possible but my experience tells me differently. I’ve used this method to get ripped, adding muscle to my frame while successfully losing fat and managed to carve out a pretty impressive physique. I was getting complimented all the time and it felt good. I want you to feel good. I don’t want you to waste your time. I want you to work smart and efficiently. That’s why I’m here. Because I’ve tried and tested this on myself and it worked. Try and test on yourself and see how your body responds, you might be surprised with the results you can achieve! This method of nutrition is known most commonly as carb-cycling. A style of nutrition that allows the body to build muscle and lose fat simultaneously by zig-zagging your calories and macronutrient intake. This method increases the metabolism to encourage fat burning while providing calorie deficits to melt the body fat. The idea behind the zig-zag method is that you cycle your week between high, medium and/or low carb days. By timing these days according to your workouts, you can achieve the jacked results you’re looking for. Aim for 1 gram of protein per lb of bodyweight. Aim for about 1.5 -2 grams of carbs per lb of bodyweight. Aim for about 0.5 grams of fats per lb of bodyweight. I like to eat just at just above maintenance level on this day, which is around 3000-3100 calories. I like to mix my proteins between chicken, tuna, x-lean ground beef, turkey and eat low-glycemic carbs such as brown rice, oatmeal, and whole wheat bagels. I eat fruits directly after my workouts. The fats are usually trace fats from the proteins (e.g. eggs and steak) and the remainder I get from almond butter and healthy oils. I get around 180 grams of protein, 380 grams of carbs, and 90 grams of fats which is around 3050 calories. Aim for 1-1.5 grams of protein per lb of bodyweight. Aim for about 1 gram of carbs per lb of bodyweight. Aim for about 0.5-0.7 grams of fats per lb of bodyweight. I like to aim for around 2400-2500 calories on theses days. I aim for about 200 grams of proteins, around 180 grams of carbs, and around 100 grams of fats. I hike up protein and fat consumption and lower the carb intake. I switch out a meal or two of slow-carbs and add fibrous carbs such as veggies. This ratio lands me at around 2420 calories for the day. Aim upwards of 1.6 -2 grams of protein per lb of bodyweight. Aim for about 0.5-0.8 grams of carbs per lb of bodyweight. Aim for about 0.7-0.8 gram of fat per lb of bodyweight. I like to aim for around 2200-2300 calories. On these days you basically eat only veggies and greens along with your heightened proteins and fats. I aim for around 270 grams of proteins, 50 grams of carbs and 110 grams of fats, which lands me at roughly 2270 calories. I prefer to use a 6 day split when I use carb cycling. If I were to use the sample schedule as a template my workouts would look like this. I like to hit the muscles hard and efficiently. Use my sample workouts provided in the muscle specific training in conjunction with this type of carb cycling schedule and see how quickly you melt that body fat and built some nice muscle. I like to make things as convenient as possible so bear with me. I eat around 5 meals a day so this is what a 3 day cycles of high, medium and low carbs would look like. I do this very simple, on a medium carb day I basically take out the carb portion of two meals and replace with an extra veggie serving. I also eat bigger protein portions (6-7 oz) to help shuttle protein into my body to feed the muscles and grow. As you can see, the only changes I’ve made were to meals 3 and 4. I replaced the complex carb with an extra serving of veggies and added a serving of fats. The easiest day to plan but the hardest to get through. I basically take out the carb portion of all meals except for the postworkout meal and replace them with extra veggie servings, and I also add some fat servings and really hike up my protein and throw in an extra protein shake (protein and water) to add some much needed protein. As you can see, the only changes I’ve made were to meals 3 and 4. I’ve replaced the complex carb with an extra serving of veggies and added a serving of fats. So there it is, try it out and see if carb cycling is for you! This is not recommended for sports athletes whose bodies need carbs to perform at higher levels! If you’re extremely active, the reduction in carbs may impair your athletic performance so it’s not recommended. Try out carb cycling and see if it’s for you! Remember to stick to the principles outlined in this article and to use the sample workouts to help you achieve that jacked body you’ve been working so hard for. Good luck and please leave any questions or comments! Pancakes..mmm.. who doesn’t love them! Thought eating healthy was boring? 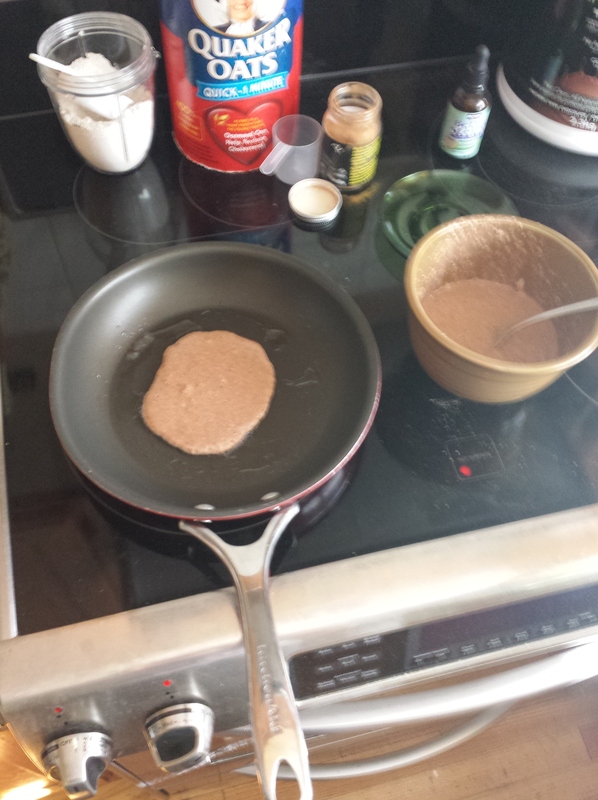 You’ll think again after you’ve had some delicious banana chocolate protein pancakes. These are some of my favourites to make! They’re delicious. They’re healthy and they’re convenient. You can make these the night before and heat them up next morning if you’re usually out the door before eating breakfast. If not these can be the perfect breakfast,post-workout meals, or meal anytime during the day. So easy to make, you’ll be wondering how you lived without em! Here are the ingredients and the recipe with pictures to help you follow along! 1/4 cup oat flour ( I use Quaker Instant oats and the nutribullet to mill the oats into flour. You can also buy oat flour at health stores, but their pretty expensive, so I prefer this little improve). 3 egg whites (You can also use liquid egg whites, just use the nutrition info to calculate the equivalent of 3 egg whites). 1 scoop of protein powder (I use Kaizen Whey Protein because it’s natural, without any GMO’s or gluten, and it doesn’t give me stomach problems. 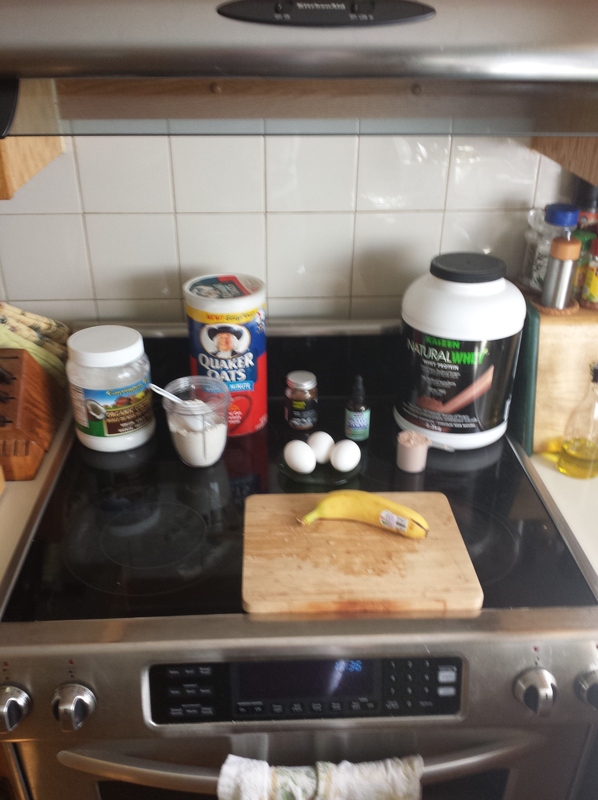 You can also use any type of protein powder; whey, casein, egg, oat, hemp, etc. Mix the dry ingredients (oat flour, cinnamon, and protein powder into the bowl). Mash the banana into a smooth consistency and add the to bowl. Break (or pour) the 3 egg whites into the bowl and mix all of the ingredients together. Place a pan on the stove and set it to medium. Grab a Tbsp of coconut oil, and coat the pan with it. After all the ingredients are mixed you should have a lightly runny consistency. Pour some from the bowl onto the pan. 6. Let it sit for a 1 minute or two, until you can slide the spatula under it without any resistance. Flip it for another minute Repeat these steps until the bowl, is empty. This mixture made me 3 smaller pancakes and one bigger pancake. **OPTIONAL: Pending on your goals, you can add this!! 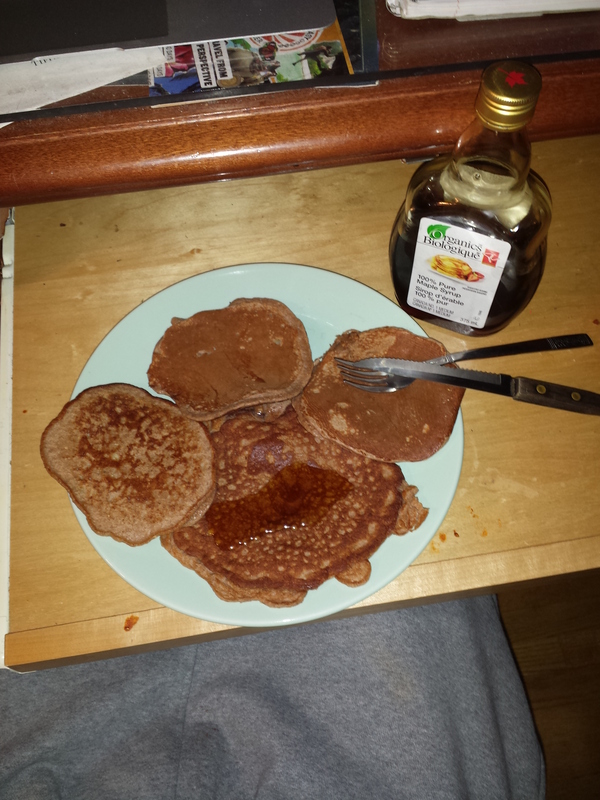 I don’t like to eat my pancakes dry, so I used a Tbsp of 100% pure organic maple syrup. I’m in Canada so this stuff is amazing and its available to me. I tend to stay away from the calorie-free, sugar-free syrups because they are full of ingredients that aren’t very good for the body. Pure maple syrup has natural sugars and has more antioxidants then blueberries and spinach. So with a little moderation, you can eat these natural sugars on occasion. Unless your allergic, in any case, natural honey and agave syrup are good alternatives!! I used this as breakfast, but the mix of protein and low-glycemic will release nutrients into my blood through the next couple of hours until I re-feed. As mentioned earlier, these are super convenient, easy to prepare and will provide a sustained energy release. If you haven’t tried them, have a go and let me know what you think!! Hey everyone, this is the third installment in my nutrition series. In this post I’ll be talking about the macro breakdowns in your meals and the importance of timing, so let’s get started. The macro breakdown of your meal determines what you will be eating for that meal and when to time it. By eating certain macro’s at certain points of the day we can ensure optimal absorption of nutrients, resulting in prime muscle recovery and growth, as well as nutrient absorption. How do we capitalize on this? Let me show you! In the original post, I explained how your body uses macronutrients. It just so happens that there are certain periods of time in which eating certain macro’s can aid in boosting recovery and metabolism. Now some may consider this “broscience”, but I’ve experimented with different timings and have found what works for me. Let’s say your eating 6 meals a day, you’ll have breakfast, pre-workout meal, post-workout meal #1, post-workout meal #2, meal. Now in each meal, you’ll want to get your recommended amount of protein, no ifs ands or buts. This is the one macro that you will be taking in with every meal. The timing magic happens with the manipulation of carbs and fats. Breakfast is a heated topic of debate. Is eating protein + carbs + fats for breakfast is more beneficial than only sticking to proteins+fats? In my opinion, no. I’ve experimented with both and to tell you the truth I didn’t notice much of a difference, that’s just me. You can experiment and see what works for your body. My general rule of thumb is to have meals consisting of only proteins + carbs before and immediately after the workout. I try to refrain from eating fats because they generally take longer to digest and I want my food digested by the time I’m at the gym so I don’t get any cramps from blood leaving my stomach and entering the muscles I’m working. I try to take in my pre-workout meal anywhere between 1.5-2 hours before I workout and I often opt for whole foods. It’s important to take in only complex (low-glycemic) carbohydrates at this time, because they take longer to digest then simple carbs and provide for a steady release of energy during the workout. Immediately after you work out, I’m talking within 30 minutes, you have whats referred to as the “window of opportunity”. When you workout, your body uses carbs for energy. In doing so, the glycogen stores (which convert the carbs into sugar and release it into the blood) become depleted and your muscles literally become a vacuum. It’s important to jump on this opportunity and take in a whey protein shake sided with some simple carbs. I prefer to eat fruits, honey, and/or natural sugars such as 100% pure maple syrup or blue agave syrup, but it’s popular to use dextrose or maltodextrin to literally rush the protein to your muscles. Hence is why we do not consume fat directly after working out, because it slows the digestion. We want to feed our muscles as soon as possible and by combining a quickly digested protein (whey) with simple carbs (which almost immediately create an insulin spike and rush the protein into the body), we can optimize the nutrient absorption and help our muscles recover and grow. So remember as a general rule of thumb, pre workout meal = protein + complex carbs , post-workout meal #1 = fast digesting protein + simple carb. The other 3 meals of the day are fair game, they should be evenly split to ensure you’re taking in your required macros. Now it’s generally recommended to eat every 2-3 hours as this will keep your metabolism burning, which we want because it shreds fat. You’ll find that this isn’t the end all be all approach and you might stumble across eating styles such as paleo, intermittent fasting, carb backloading, if it fits your macros, etc. I will cover these in the future, but this method is tried, tested and true. Its worked for me and my friends and it should serve as a functional base for your goals. Once you learn how your body responds to different eating styles over time you might find something might work better, but thats in due time, for now I recommend trying this out and seeing how it goes for you. Many people wonder about eating at night and if it will make you fat. I, for one, call bullsh*t on this! My view and whats worked for me has been getting in all my macros and calories every day. Your metabolism doesn’t just shut off at 8pm and store food as fat. Calories in vs. calories out, if you’re hitting your cals and macros, it doesn’t matter what time of the day you are eating. So that pretty much covers this topic, again if you have any questions feel free to ask and I’ll do my best to get back as soon as possible. If you’re here because you’ve already read my post Nutrition 101: Macronutrients, please read on, if you haven’t click here to check out the first lesson in Nutrition before returning to continue your learning. So we know about macronutrients and you’re probably thinking holy sh*t, this must be really time-consuming and difficult to maintain. This is the point at which you decide how strict you want to go! If you’re looking to get into contest shape or planning to be a fitness model, you’ll want to have a plan of action with your macros and track each one so you can monitor progress and adjust based on how you look. That’s a different story, and I will be writing an article about specifics in another post shortly and linking it here. This post caters to the beginners, who haven’t followed anything specific and don’t know where to start. I’ll break this up really easily for you. The good news is that there are many ways to achieve your nutrition goals. Some prefer to cook their meals for the day everyday, but in this day and age, it is much more practical, convenient, and efficient to prep are your meals once every 3 days. For me, Sunday and Wednesday nights work. I grill all of my proteins and prepare my carbs as well, all this alongside some salads and vegetables. So what do I recommend? A visit to your local dollarstore, walmart, target, etc, to buy some Tupperware containers. Why? Because this will make your life SO much easier. Grab a small cooler as well, this will give you a place to store and carry around all your food so you can eat on a dime and you’re never left unprepared. This may seem like a weird order of events but bear with me. It just makes more sense to get the elephant out of the room right now. You’re going to have to be prepared, and failing to plan will lead to failure to execute. Before you continue reading, please understand that I myself don’t count calories because I’m just maintaining my current physique. I’ve been eating like this for so long I can tell portions without weighing them and I know the nutritional profiles of what I usually eat, and if you’re a beginner you most likely wont, so make sure you track what you eat. This will help you greatly in making necessary adjustments based on your progress. So we now know about macronutrients and why they are important, but what role do they play in our plan? You’ll see, but for now it a good idea to find your Daily Caloric needs, which can be calculated by clicking here. This will give you the amount of calories that you need to maintain your current weight. Now for the plan, if you’re trying to gain weight/build muscle you’ll be adding anywhere between 250-500 calories/day to that amount. If you’re trying to lose weight you’ll be dropping about 250-500 calories/day. You should be dropping about a pound or gaining about a pound for every week. That’s what’s considered normal. Remember that these numbers aren’t exact! Everybody is different, take a week or two eating at a caloric increase/deficit and see how you weigh, if you’re not gaining or losing you’ve gotta adjust accordingly until you find out what works for your body. Just remember, if you’re focused on losing weight, during the first week, the healthy eating and exercise will shock your body and you may lose anywhere between 3-10 lbs. This is water weight, aside from the first week, you should be losing about a pound a week. Almost done promise! Now that you’ve got your set amount of required calories, you’ll have to figure out how many meals you will have. I usually have anywhere between 5-7 meals a day, consisting of 3 larger meals and 2-4 snack meals, depending on whether I’m training that day or not. So what you’ll want to do is divide the total calories by how many meals you plan to have. It’s generally recommended to eat in 2-3 hours intervals in order to keep the metabolism revved. Some live by this others are against it. Like I said earlier, it works for me and that’s what matters. Find what eating regime works for you and stick with it, just make sure you’re getting in all of your required calories!! Ok so we’ve got our caloric requirements and we’ve determined how many meals we will eat each day, what’s next? Cooking your food and preparing the meals with the right macro’s. The general rule of thumb is to take in about 1-1.5 grams protein per lb. of bodyweight, 1-2 grams of carbs/ lb. of bodyweight and 0.5 grams of fat/lb. of bodyweight. For example, at the time of this writing I weigh 186 pounds. To fill my caloric requirements, I need to eat anywhere between 186 grams- 279 grams of protein, 186-375 grams of carbs and approx. 95 grams of fats. I know from personal experience that I need about 3000 calories to maintain my current size. To get my required calories and macros, I would need to eat about 240 grams of protein (240×4=960 cals), 300 grams of carbs (300×4=1200) and around 95 grams of fats (95×9=855 cals), which adds up to 3015 calories. Knowing this, you can divide your macronutrients by the amount of meals you’ll be having and set goals for each meal (e.g. If I eat 6 meals in a day, for each meal I should aim for about 40 grams protein(240/6), 50 grams of carbs (300/6) and 16 grams of fats (95/6). Be sure to check out my post on macro meals breakdowns and meal timing, by clicking here, to see how to manipulate the macro’s in each meal to optimize nutrient absorption and recovery. Find your daily caloric needs and adjust them based on your goal. Divide these calories up by the amount of meals you’ll have and your macro requirements . Prepare your proteins, carbs, fats and veggies/greens on the same day, and have your Tupperware containers ready. Once finished making all the food, mix and match your protein, carb and fat sources into each of the containers and you’re set! What’s worked for me is using my fist size to judge portion sizes. This makes it so easy to prepare meals and takes the hassle out of the meal planning. One fist size for me is about 5-6 oz of protein, 1 cup of carbs, 1 cup of veggies/greens and a tablespoon or two of fats. Using this method, when I prepare my foods, I toss in a chicken breast, 1 yam and a cup of broccoli into one Tupperware case and in the other I’ll change my protein source and throw in a fist size portion of extra lean ground beef with a cup of brown rice and a cup of mixed greens. Sounds easy right? It is. Use this method to ease into the habits of healthy eating. If you’re just looking to lose weight or build mass this helps. If you’re not losing weight, switch one carb serving for an extra serving of veggies/greens. On the mass building plan, if you’re not gaining, increase your carbs to a fist and a half for a meal or two and see how that goes. It’s all played by ear, if it works keep it going, if not make simple changes, experiment and adjust based on the results. I’ll make some specific nutrition plans for weight loss and muscle gain in time, but for now remember to keep it simple and make small changes where necessary. Remember I’m here for you during this journey, if you still find something confusing, feel free to leave a comment and I’ll get back with an answer as soon as I can! Before I get into the nitty gritty of muscle specific workouts and workout programs, I want to make it known to all that nutrition is easily 85% of the battle. If you want to make a transformation, be it lose weight and tone up, lean out, or to pack muscle, whatever your goals are, you’re nutrition has to be spot on, I CANNOT stress this enough. Having a sound nutrition plan and staying consistent with it is a KEY ingredient (see what I did there) in the recipe for success. It’s said that failing to plan is planning to fail and I agree completely. So now that thats out of the way, let me get into the nitty gritty of nutrition and show you that it doesn’t have to be as difficult as people make it. There are many ways people go about nutrition and food prep, but the most successful people are those that plan ahead and are always prepared. Being prepared allows for consistency and ensures that your body is receiving enough nutrients to recover and grow. Don’t think of this as a diet! You’re changing your lifestyle here, this isn’t something that you follow strictly for said amount of weeks and then you go back to eating junk food. This is a change for the better. You’re doing your body good with this and trust me, its not as hard as people make it out to be. Okay, so now we know that nutrition is vital for a successful transformation and preparation is the best way to ensure consistency of this nutrition. These three macronutrients provide the calories that you see listed on as the total amount of calories on your label. These guys are important so pay attention! Proteins have 4 calories per gram. Carbs also have 4 calories per gram. Fats have 9 calories per gram. What does this mean? Well, take you’re calculator and multiply the amount of fat shown on the label, in grams, by 9. Next, multiply the total carbohydrates by 4 and the total proteins by 4. Add them all up and you should receive the total calorie amount shown on the label. This means that proteins, carbs and fats are what we must feed our body with for it to be able to recover and grow from your intense training sessions. Now every food has its own macronutrient profile, some foods are build mainly of carbs (e.g brown rice and oats), some of mainly proteins (e.g turkey, chicken, fish), and some of mainly fats (e.g coconut oil, nuts, flax). The goal of proper nutrition is to manipulate the numbers of proteins, carbs and fats into a macro ratio, which will be planned according to your goals. Most people use the 30 P/40 C/30 F ratio, meaning 30 percent of your calories will come from protein and another 30 percent will come from fats, and the remaining 40 percent will come from carbohydrates. I will make a post in this series about different macro ratios and describe what goal each will help attain, as for now read on! Proteins – Chicken, Fish, Turkey, Whey Protein, Eggs, Beef, Poultry, Lamb, etc. Fats – Coconut Oil, Nuts, Flax Seeds, Fish, etc. At this point, I’ll explain how your body uses these macronutrients, so play close attention, this is important! Protein: Your body uses protein to help rebuild and repair muscle tissue. When you workout, you rip muscle tissue, thats why you feel sore the day after. By getting in enough protein, you will be able to help your body repair the ripped tissue and grow. Carbs: Carbs are your bodies preferred source of energy and they are required for you to function. The brain needs carbs to work and the body uses them for energy. Fats: Help promote good health, brain function and help protect your limbs and joints from damage. Okay cool! So we’ve covered what macros are, how your body uses them and I’ve given some examples of foods that fit in each category of macro. What now? Well head over here to find out how to prepare your nutrition battle plan. If you have any questions, please feel free to comment and I’ll get back to you as soon as possible!